Follow the story with a discussion of the importance of using your eyes and paying attention, then show the kids “mouse-eye” views of items in the library and have them guess what the items are. In preparation for this activity, take ultra-close-up photos of the items using a digital camera, then either print the pictures or connect the camera to a TV screen to share them with the group. Then let the children take turns taking close-up pictures of items (with help) and having the others guess what the items are. This is a wildly popular activity with kids of all ages, and the hands-on component enhances confidence for kids of every ability level. To extend the activity even further, print the pictures and place them on a bulletin board with the close-ups hanging over the regular views, so that others in the school or library can guess and then lift the top sheet to check their guesses. 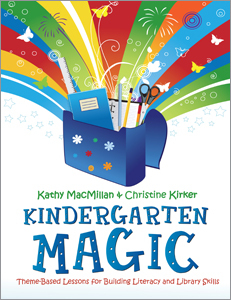 Find more great activities for school and public library programming in Kindergarten Magic: Theme Based Lessons for Building Literacy and Library Skills by Kathy MacMillan and Christine Kirker, available now! Visit Kathy and Christine online at www.storytimestuff.net.